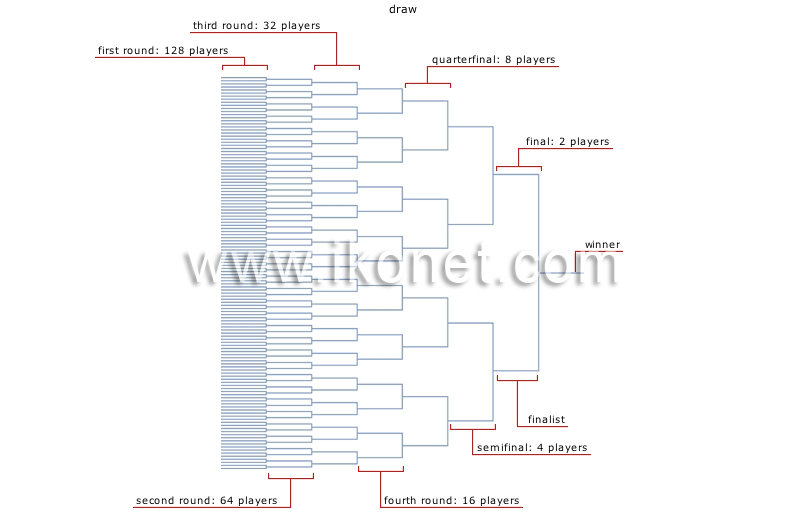 Table showing the names of players or teams competing at various stages of a tournament. Each of the two players or teams that qualify for a final. Player or team that wins the event. Final: last event of the competition; the winning player or team takes the tournament. Second to last event in a competition in which two of four players or teams play against each other; the winners move on to the final. Event in a competition in which two of eight players or teams play against each other; the winners move on to the semifinals. Event in a competition in which two of 16 players or teams play against each other; the winners move on to the quarterfinals. Event in a competition in which two of 32 players or teams play against each other; the winners move on to the fourth round. Event in a competition in which two of 64 players or teams play against each other; the winners move on to the third round. Event in a competition in which two of 128 players or teams play against each other; the winners move on to the second round.